As expected, the stock market managed to reverse its decline, spending much of the last full trading week this year in positive territory. 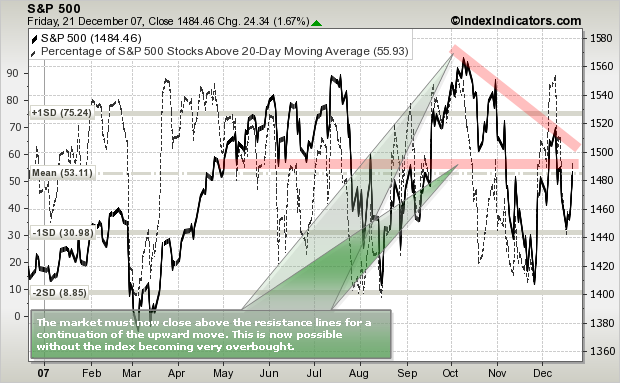 But now the index is just below the previously discussed resistance lines again. Earlier this month, the index managed to break the 1490 resistance, but became overbought by the time it reached the downward sloping resistance. Actually, the market was at its most overbought level this year, if you measure it by the percentage of stocks above their 20-day moving average. Not surprisingly, it had to decline while the overbought conditions were being resolved. Also, unfavourable news regarding monetary policy did not help the situation. This time, this index is closer to the resistance lines and the indicator is at a more comfortable level, which should increase the longevity of a break should it happen again. And, if you believe that most of the negative news is out of the way for now, then there is a real possibility that we could come close to the all-time high. Market commentary will be back in the new year. Merry Christmas, Happy Holidays and Best Wishes for the New Year.